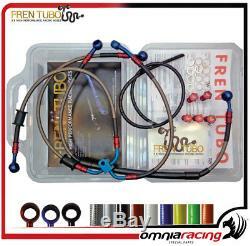 Hoses brake kit 2 frentubo triumph street triple r trofeo 2009/2010. Number of hoses in the package: 2. Hoses brake kit aereonautical for motorcycles frentubo type 2. The kit is complete with steel reinforced with standard and transparent jacket and sheath, standard fittings and pins ergal (unless otherwise specified). The brake tube kit is complete with all bolts and fitting accessories, including both aluminum front tubes and fittings, and rear fittings, complete with fittings, bolts and gaskets. The fren tubo kit eliminates the annoying "lung" effect during motor braking, thus improving the power and sensitivity of the front and rear brakes. Aircraft brake tubes significantly improve the braking system of the bike. Designed for racing, this motorcycle, motorcycle and motogp, this type of piping has a remarkable yield and is an important change to be made to any kind of motorcycle brakes. The kit type 2 thanks to the lightweight alloy fittings saves a bit of weight by giving the bike a racing look. The kits are specially designed for the original bike shown, so do not require any modification, all are tuv and dot certificates. They are all specific plug & play for each brand / model / year of motorcycle. The package includes the necessary installation, where applicable, installation instructions. The hose may be required in the following colors. Fittings can be in the following colors. Technical specifications for type 2 kit. Stainless steel braid tube with outer sheath and anodized aluminum alloy fittings. Conforms to fmvss 106 standards. Minimum burst pressure: 827 bar. In the case of racing brembo or accosszato racing aftermarket radial pumps it is necessary to comply with the recommendations of the manufacturer of the brembo, castrol, motul type, taken from a sealed bottle. We do not recommend using oils dot 5 o dot 5.1 as if they are perfectly compatible with frentubo, they are not compatible with the gaskets of most brake pumps. Brake / clutch tube kit no "standard\The tubes are a safety device and can only be installed by qualified personnel. In 1994, the passion and experience of manufacturing bertollini created omnia racing, with the aim of representing a reference point for everyone fond of bikes. On the web, we are always associated with a direct contact with the customers, so we suggest the product that best suits their needs. This should allow our customers to feel at ease. All this has not been a decade ago, a reference point in italy; in addition, our products are still in demand in Europe and in the United States. The item "Brake hose kit 2 frentubo triumph street triple r trofeo 2009/2010" is on sale since Wednesday, February 7, 2018. It is in the category "auto, motorcycle parts, accessories \ motorcycle \ spare parts \ brakes, suspension \ brake pipes, pipes ".